Another delicious recipe from Cooking Light! 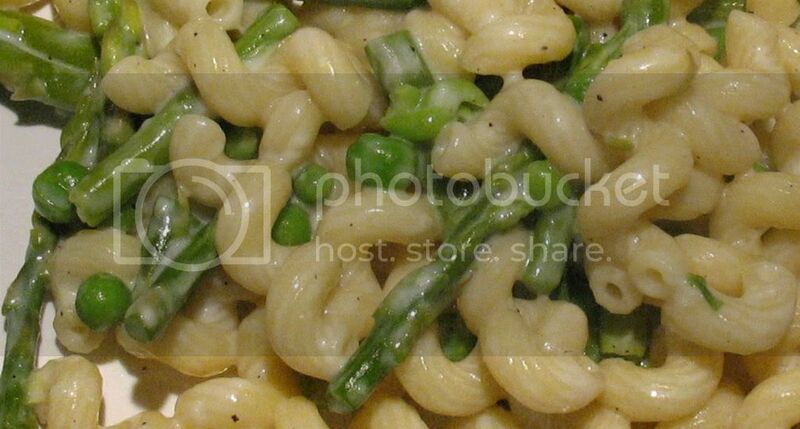 This recipe for Pasta with Lemon Cream Sauce, Asparagus and Peas is a quick and easy weeknight meal. My husband and I often eat meat-free meals, but most are heavier in flavor and rely on a tomato base. This is quite different from our usual fare. I actually selected the recipe several weeks ago when I was looking to use up heavy cream left over from my ice cream making adventure, and some excess asparagus. I was amazed at how quickly the dish came together. While the instructions list the pasta and sauce preparation serially, I prepared them concurrently. I started making the sauce at the same time I threw the pasta in the boiling water. I think it took about 20 minutes from the time I put the water on to boil to when I tossed the pasta and sauce together. I followed there recipe pretty closely, altering the ingredients and procedure only slightly based upon what I had in the house at the time. Since I didn’t have cornstarch, I thickened the lemon cream sauce with about a tablespoon of flour. I also added a handful of Parmesan cheese at the same time I added the cream. The lemon cream sauce is smooth, light and fresh. The bright tang of lemon and the tasty crunch of asparagus hint at the coming of spring. Served with a Caesar side salad, it was a refreshing and fun weeknight meal. 2. During the last minute of cooking time, add asparagus and peas. 3. Drain pasta mixture and set aside. 4. Melt butter in a saute pan over medium-high heat. 5. Saute garlic for 1 minute. 6. In a separate bowl, whisk together cornstarch and broth. 7. Add broth mixture to saute pan and bring to a boil. 8. Cook 1 minute or until thick, stirring constantly. 9. Remove pan from heat and stire in cream, lemon juice, salt, black pepper and red pepper. 10. Pour sauce over pasta and toss to coat.